Harriet knows that modelling won’t transform you. She knows that being as uniquely odd as a polar bear isn’t necessarily a bad thing (even in a rainforest). And that the average person eats a ton of food a year, though her pregnant stepmother is doing her best to beat this. What Harriet doesn’t know is where she’s going to fit in once the new baby arrives. With summer plans ruined, modelling in Japan seems the perfect chance to get as far away from home as possible. But nothing can prepare Harriet for the craziness of Tokyo, her competitive model flatmates and her errant grandmother’s ‘chaperoning’. Or seeing gorgeous Nick everywhere she goes. Because, this time, Harriet knows what a broken heart feels like. Can geek girl find her place on the other side of the world or is Harriet lost for good. 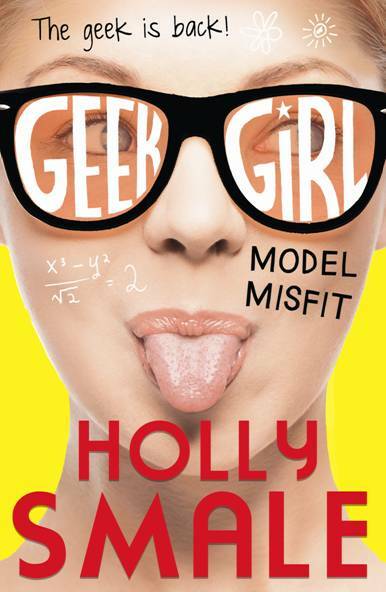 Geek Girl: Model Misfit is the second installment in the hilarious Geek Girl series by Holly Smale and let’s just say I was totally jumping up and down when my review copy came through in the mail. This was one of my most anticipated reads because I LOVED Geek Girl and I was more than ready to jump back into Harriet’s life. Harriet returns in this brilliant sequel and is still the geekly, unlucky girl we loved in Geek Girl. This time round Harriet has a broken heart and doesn’t know how to feel about the new baby. Feeling lost and confused Harriet suddenly isn’t feeling very optimistic about these school holidays when her best friend Nat, is whisked away to France. But when your next modelling job is located in Tokyo.. maybe the holiday won’t be such a bummer at all. One thing I know for sure is that these books never fail to brighten my day and Model Misfit was just as good if not better than book one. I love Harriet so much and she had me laughing and wanting to hug her all in one. You could say that Harriet has matured a lot but she’s faced with a whole new batch of problems this time round and I really did sympathise with her. Harriet’s witty and geeky personality is so admirable and I can’t get enough of her fantastic facts. I may have to use them in order to convince people I’m intelligent :P SO many times things would happen to Harriet that left me saying ‘Oh no’ and then wanting to reach through the pages and hug her. You could say I feel a certain protectiveness over her. I also love so many of the secondary characters in this story and relationships were tested and strengthened in Model Misfit. Harriet’s relationship with Nat was one I felt we got to appreciate more because it was really obvious that all though they had completely different personalities, they had a really loyal friendship. Toby my favourite little stalker does return in this book. How could we have a Geek Girl book without it starring Harriet’s loyal, intelligent and socially awkward stalker Toby? I feel he’s such a vital character to this series because he truly cares about Harriet and the two are quite alike. Without spoiling anything, I really liked his involvement in the story. We are introduced to characters new and old and I could not get enough of Wilbur’s hilarious and creative nicknames - many of which I am planning on using from now on because they're definitely something. Harriet’s eccentric step-grandmother makes an appearance and I liked that we got to see more of Harriet’s family. I love the Manner’s family because although Harriet struggles to see it, they love her dearly. Their strong connection really is apparent throughout the novels and it was something I really liked because I come from a really close family myself. I love that Annabel and Harriet do have a mother daughter bond whether their blood relatives or not and you can see that some of Harriet’s qualities were inherited from both her father and Annabel. I really shipped Harriet and Nick in book one so I was really interested in seeing how their relationship would go in Model Misfit. Lovestruck Harriet has no knowledge of boys and it doesn’t help that her now ex-boyfriend is always around. I really like them together and once again I just wanted to tell Harriet that it’s all going to be okay. I’m seriously trying not to spoil anything but I’ll say that I was pleased with how things were handled between them. Holly Smale’s writing is what i’d describe as funny, addictive and refreshing. Something about it keeps you turning the page and it’s as if Harriet is recounting the tale to you. Her voice comes through the page and you can’t help but laugh, cry, and smile with her. Both books left me with a satisfied and warm-gooey feeling and had me wanting a instant re-read. Model Misfit was an inspirational read because it presents a really important and special message. Geek Girl 1 and 2 have taught me some really valuable things and to 'embrace my inner geek' and I’m really grateful to Holly for that. This was a fantastic sequel and one I loved the whole way through. This series is just so brilliant and if you haven’t gotten on them, you really must because I can’t begin to do justice to these great books. I’ll be anxiously awaiting book three and I want to thank Holly for writing such a brilliant series. I didn't read the review because I was afraid of spoilers because I haven't read the first book yet but I can tell you loved it. You're lucky for being able to receive it for a review. This series sounds like a cute contemporary that I'd like to pick up :) Thanks for your review Sunny! AH! I can not wait to read this one, I really liked the first book and am so excited for the sequel. I love her writing, and I'm glad the romance was a bit better! I actually don't think I finished the first one, but you're making me want to now because of this second one! The secondary characters sound great as does her writing. Great review!